Feature comparison OS X Server vs Nethserver: anything missing? OS X Server out-of-the-box versus Nethserver one-click-install. 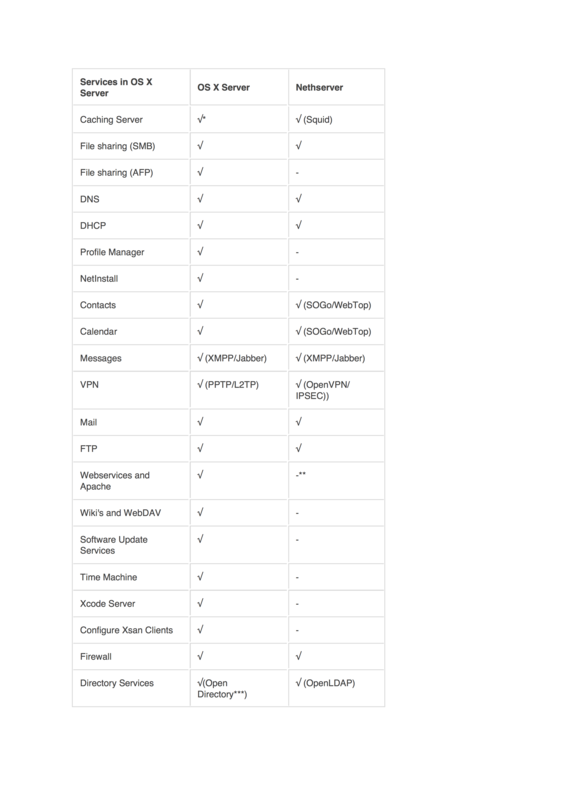 The first table shows all services provided by OS X Server and the comparable services (if available) in Nethserver. The second table shows the additional services available in Nethserver. Keep in mind that I am comparing out-of-the-box OS X Server with Nethserver one-click-install services! Profile Manager (Apple device management incl. MDM for iOS devices), NetInstall (providing NetBoot images), Software Update Services, Xcode Server and Xsan are - again from my perspective - not relevant for the primary audience Apple is targeting with OS X Server (services reminding of Apple Xserver history . . . ). 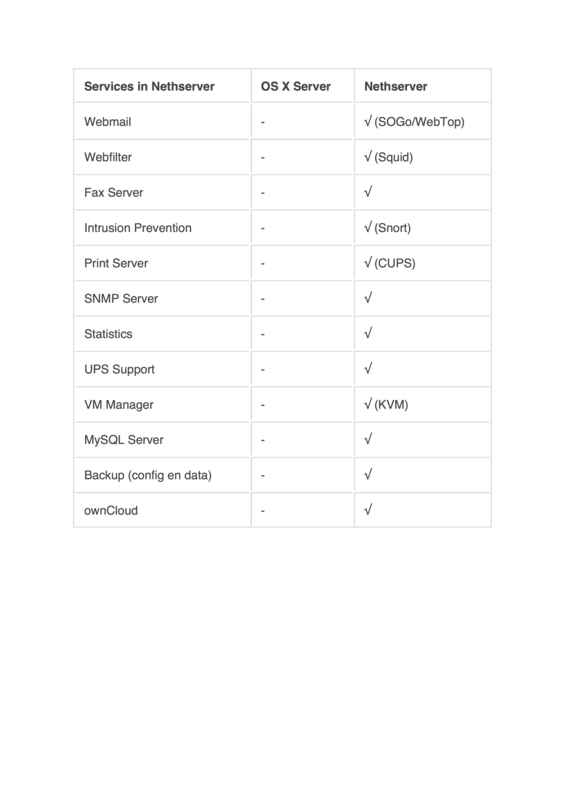 The services available in Nethserver but not in OS X Server, especially the groupware and print server services are a great plus! One wish regarding the print service, add AirPrint, to make it possible to use non-airprint capable printers from iOS devices. On Debian AirPrint functionality is provided by the following packages: avahi-daemon avahi-discover libnss-mdns cups cups-pdf gutenprint pycups avahi python2. For me personally it is not a problem to experiment and add the mentioned ‘missing’ functionality from the commandline. For most potential OS X Server users however, this is not the case. To make Nethserver a true OS X Server alternative (more stability, better reliablilty) adding the mentioned missing services as a one-click install and adding them to the WebUI really is a good idea. **** Users having a single dedicated server machine running either OS X Server or Nethserver providing network services to a small (…) group of users. That’s a good report from Apple Users perspective! Thanks for your time, I really appreciate it! Webservices: with our Virtualhost panel we’re on the right track. Fisrt of all, I ant want to thank @jaapvdv. A package Nethserver-avahi already exist… We only have to invertigate where is it and to make it available in the center sofware, it can be realy easy to make a one click install. 1 - make a nethserver package to instal and configure the firewall ( open the port for all green subnet). 2- use the actual Smb share module to define what to share with what "rights"
3- make a button to set the previous definition as a AFP share. I waiting impatient a good wiki developer documentation to make the first point ( subliminal message inside ) to make a nethserver-netatalk package. The second point already exist. DokuWiki is already running in a Debian VM on one of my ESXi hosts! Wiki and WebDAV is the service name used by Apple! Well, I already have an AirPrint server running on one of my Debian VM’s. I’ll have to find the time (and server CPU/memory capacity) to setup a (couple of) Nethserver VM’s to test all of this stuff. I had already an Airprint printer, but it could be really interesting to adapt Nethserver to have this function. Can you tell me more? Plaese. OS X Server has the capability to define one server as directory master and the other server(s) as slave. All part of the Open Directory service. If the OD database off the master gets corrupted it is possible to ‘promote’ a slave to master. I always prefer to not ‘put all eggs into one basket’. So if Nethserver could/would provide this kind of master-slave capability it would be pretty ease to use a Nethserver machine to provide mail and SOGo (webmail/CalDAV/CardDAV) services and another for instance for web and wiki and maybe a third for file services and own- /nextCloud, where all three are using the master LDAP db on the mailserver machine. I followed one of these instructions to configure a Debian VM. With MacOs Sierra, Apple killed the Apple File Protocol! This one is not necessary anymore. Even a Time Machine backup can be done over a SMB share. I will upped my own wiki page about this subject. For the Profile Manager, MacOS support OpenLdap, and a rapid search show result about iOS could support too. For the two last point the wiki and webdav, these two point now already exist with the docuwiki and Nextcloud. Sounds interesting, please share with us your screenshots so we can document the process. Well, Apple does no longer develops AFP and prefers SMB, but both macOS and macOS Server still support AFP for file sharing and will probably continue to do so for the next couple of years, if only for backward compatibility. So to say AFP is no longer necessary in a server product . . . .
Ehi @jaapvdv happy to see you still around. What’s up? Did you install any new NethServer in the Netherlands? Well I wouldn’t put it as blunt as that, but when it comes to adding AFP support to NethServer you are absolutely correct. 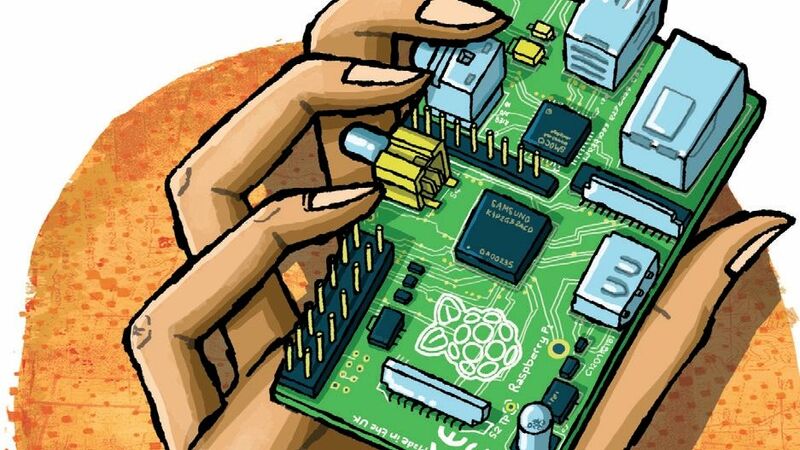 Those who need AFP / netatalk can install using Jim’s howto! And I repeat here, AFP isn’t required anymore in MacOs Sierra.